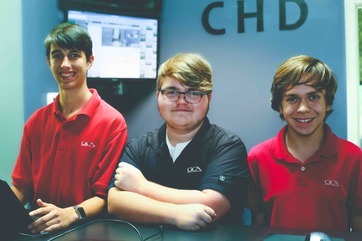 Welcome to our GCA Computer Helpdesk (CHD) section. We hope we can help you with all of your technological needs. Our Acceptable Use Policy (AUP) has recently been revised to reflect current computing and security standards. It's Georgia Cumberland Academy policy to require the AUP to be reviewed by its employees on a yearly basis. However, because of the recent update, some of you may be receiving emails requesting your review earlier than that. You will be fined at the end of the year, or whenever you withdraw from GCA. The Computer HelpDesk will decide if any damage has been done or. All acts of intentional damage will be prosecuted. If the computer case and charger are not returned, this also demands for a charge. Students can set up their smartphones to send and receive email from their YourID@gcasda.org address. Usually the only information you need to know is your user name and your password. (Your user name is the first three letters of your first name, first three letters of your last name, and the year you graduate with @gcasda.org at the end. An example would be John Smith who graduates in the year 2019. His username and email would be johsmi19@gcasda.org). If there are issues connecting to your email that are not related to username or password, double check your Wi-fi or Data connection. If there are still issues then checkout Office 365 mobile setup page. How common is your password? It's a good security practice to not use the same passwords and usernames on different sites. Once one site is hacked, if your usernames and passwords are the same, then it's simply a matter of trial and error finding other sites they can access. Introducing some variety into your usernames and passwords may be a little harder to remember, but it's a lot easier to remember usernames and passwords than it is to reconstruct your identity if it gets stolen. At the bare minimum, you shouldn't share usernames or passwords for sites with personal information, especially financial information or sites that have access to your name, address, SSN or other identifying data. Speaking of passwords, take a look at the Wall Street Journal article analyzing a list of passwords. It's rather alarming at the amount of people using 123456 or "password" as their password (3000 and 2000, respectively). Sports are also high scorers (baseball, football, soccer), as are superheros (batman, superman), games (nintendo, pokemon) and animals both real (monkey) and fictional (dragons). You should check out the article and then consider changing your password today to something more secure, especially if it's something close to one that's on that list. Hackers. Phishers. Keyloggers. Viruses. Malware and Spyware. All trying to get your information online. Are you doing the most you can to keep your private information private? Visit our Security site to find out how to best protect yourself from malicious attacks online. Need help with a computer or account issue? Have questions about your accounts, dorm connection, office computer or other related issue? We can help! What type of computer will I get when I come to GCA and can I customize it? Your computer will be an IBM Lenovo Thinkpad Yoga 11e business class laptop. Yes, you can put an approved laptop sticker on the case that does not leave any sticky residue and comes off easily. Where can I get computer service on campus? The GCA Computer Help Desk located in the Science Building. What Email can I use at GCA? Every semester every student starts off with $10 worth of printer credits. For the normal black and white printers the cost for one page is 0.10$. For the library printer it cost $0.25 for one colored page and $0.05 for black and white. Go to the business office and pay the fee for more printing credits they will give you a receipt to bring us then we will add more print credits to your account. What software is on the GCA Laptops?